Usually in our Bionicle reviews here on OAFE, we go through each toy from the set individually to review them all - but today I've decided to review the entire set of Bohrok Va in one review. This is partly because I'm lazy, and partly because the little critters in this set are so similar that I'm sure I can give them all good coverage in one review rather than dragging several reviews out to cover them all. 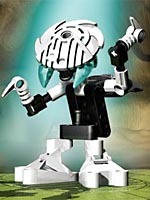 These small creatures act as scouts and couriers for the Bohrok, often carrying new krana to Bohrok who have lost theirs. The source of these krana remains a mystery. After the first sets of Bionicle (with the Toa and the Rahi), a second series introduced the Bohrok - the ingenius and popular enemy figures to swarm the heroes, each one of the six colors of the Toa, armed with a dual set of "claw"-like weapons at the end of each arms. 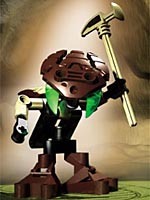 Like the Toa have their own assistants - the villagers of Mata Nui - it seems that the Bohrok also have sidekicks, the small Bohrok Va. Each one a tiny figure standing 2"-3" tall, each with a head made from one of the "claw"-like weapons of the Bohrok, supporting one or two weapons which matches the color/element scheme of the Bohrok. As strange as this sounds, these little guys actually look really good, and fit into the Bionicle world very nicely. This comes down purely to the excellent design of the Bohrok Va, which seems parrellel to the genius that allows the Evangelion series by Kaidoyo to move in ways previously unheard of by action figures. 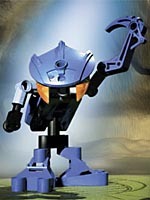 Each Bohrok Va has a simple two-part body including a torso and a pelvis, connected via a Lego joint which allows the Va to stand up straight, or bend over - then the torso has two arms and a neck which holds the head on a "balljoint"-like Lego piece, and the pelvis has two legs which make his stand. In all it's simplicity, the design gives the Va a great deal of movement and character - it allows for about 10 points of articulation and lots of poseability (aside from some small issues, like the inability to have wrist joints due to the + shaped connectors). Each Va can stand tall and proud, weapons raised, or bent down and ready to attack - it's great. There's a slight drawback with the arm articulation which lies with the action feature of the Bohrok Va - as mentioned, the Va carry new krana to return to Bohrok who have lost theirs, and so each Va includes two krana (a new color to the previous krana included with the Bohrok) one of which fits onto the Va's back, and can be "launched" by flicking one of the Va's arms. This means that only one of the Va's arms is actually articulated - the other works this action feature. This is a little annoying, but can be fixed by taking the back piece off the Va and just making both arms articulated instead. Pahrak Va - The brown Bohrok Va looks one of the best, with a great color scheme of brown, creme and green eyes, plus a nifty hammer for a weapon. He only holds the hammer in one hand though, leaving the other hand looking empty, as with all of the Va who only have one weapon. His symmetrical head works better than many of the other Va and he's one of my favourite overall. 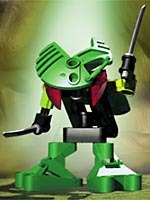 Lehvak Va - The green Bohrok Va has two great machette weapons, making him one of the deadliest of the Va, yet his head doesn't look good at all; made from the strange pnuematic-leaf claw from Lehvak, it doesn't look as threatening or nifty as the others. His head articulation also differs from the other Va - rather than have his head balljointed, his head only moves up and down because the claw section of his head is balljointed instead, which is just strange. (Of course, because this is Lego, you can just change the toy so its head is balljointed, but still.) My least favourite of the Va, but with a nifty color scheme and decent weapons. 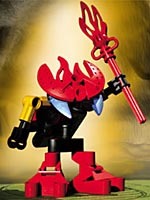 Tahnok Va - The red Bohrok Va, this guy is armed with a strange fire-on-a-stick weapon and a head that's on fire. He's weird but I've grown to like him - the fire-on-a-stick is probably the strangest of all the Va weapons but it's not bad, and it suits the toy. His blue eyes are nice and dark, which make a good contrast to his head (which, as noted, is on fire). Gahlok Va - The water Bohrok Va doesn't look right at all - it could be that his head is made out of a flipper reject, or that his single scythe weapon looks out of place (it's huge on one hand, and then the other hand is just empty). His scythe arm looks better when it has two arm pieces instead of one - but as it is, he looks right with the other Va, but he looks a little strange on his own. Kohrok Va - After Gahlok Va's massive scythe, Kohrok Va's tiny little ice-claws don't look half as impressive as they should, despite how nifty they are. This Va looks really cool - his icy color scheme suits, with icy whites and light blue eyes, doubled with his double ice-claws, this is a very cool customer, yet I think his ice-claws should have been molded bigger (instead of reusing the original Bohrok teeth). Nuhvok Va - The best for last, Nuhvok Va is dark and creepy, with the same huge claw-hands as the dark Toa Onua. His head is made of the pnuematic-hammer weapon of Nuhvok, which has a gieger-esque look about it as Nuhvok Va's head - combined with the oversized claw-hands, Nuhvok Va looks scary. His glowing eyes are great too - he's definately the Bohrok Va to get. 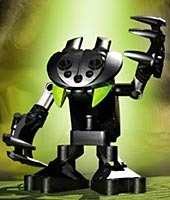 In addition to the six individual Bohrok Va, there are instructions on the Bionicle website to make the Bohrok Va Kaita, two bigger creatures which are made from three of the Bohrok Va. The first of these is made from Kohrok Va, Gahlok Va and Lehvak Va; with two claw weapons, he looks like a large Bohrok-insect monster. He's big but not nearly as nifty as the other, which is made from Nuhvok Va, Tahnok Va and Pahrak Va, which looks a lot better with the more suited color scheme and the better weapons (a hand of fire, and a big claw hand) looking like a large Bohrok-mechwarrior. Sure, these bigger toys aren't as nifty as the individual Bohrok Va but they add some more value to getting the set, and it's fun to build and customise them. The best selling point about the Bohrok Va is their price; these guys aren't expensive at all, at anything from $1 to $3 a piece, it's easy to collect the whole set and they fit in with other Bionicle toys very nicely. They're also available in plenty of places, and definately worth going out of your way to find. The Bionicle line continues to impress and I look forward to the next part of this innovative series.